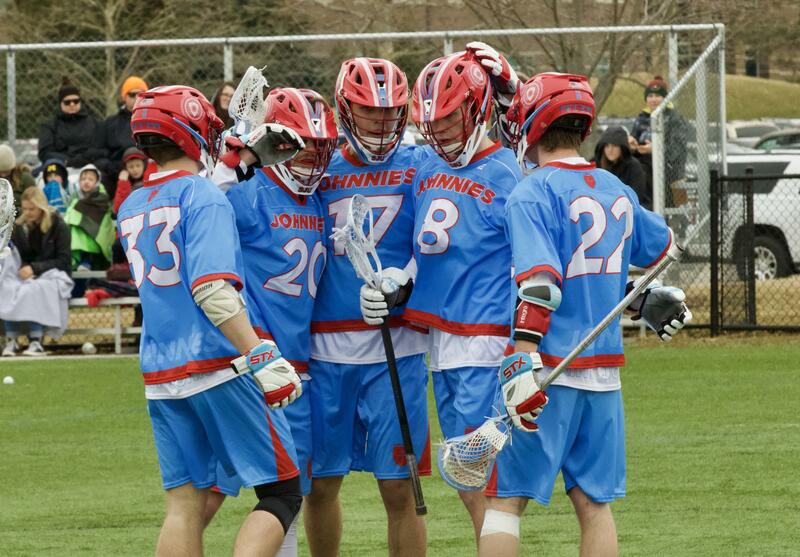 COLLEGEVILLE, Minn. – It was a tough three-game weekend for Saint John's in Allendale, Mich. as the Johnnies suffered their first losses of the season, dropping a pair of Upper Midwest Lacrosse Conference (UMLC) games to No. 2 Dayton and No. 5 Grand Valley State, before defeating Illinois. Saint John's will look to rebound as it prepares for two games in three days. "That's the thing about the UMLC," said Saint John's head coach Derek Daehn. "Every conference game you play, it's going to be a challenge. Unfortunately last weekend didn't go the way we wanted but the only thing we can do is turn our focus onto the next game." First up for the Johnnies is a road trip north to face off against the top-ranked Minnesota-Duluth at 9:30 p.m. on Thursday, April 4 at Griggs Stadium. Despite the difficult opponent, the matchup may come at the best time for Saint John's. "Honestly, I think it's a perfect time for this game," said Daehn. "We can't sit around and feel sorry for ourselves because we will have to be at our best against Duluth." Saint John's was able to edge out the Bulldogs in the teams' last meeting during the 2018 season which saw a 9-8 victory for the Johnnies at the Maple Grove Sports Dome. Minnesota-Duluth has been nothing short of great this year with a 7-1 overall record. Some of the Bulldogs' notable wins have been against No. 2 Dayton, No. 3 Kennesaw State and No. 6 North Dakota State with their only loss of the season coming last weekend against Division I opponent Davenport University. Capping off the weekend will be a clash against the reigning MCLA DII national champions and No. 6-ranked North Dakota State on Saturday, April 6 at 2:00 p.m. The game will take place during the second-annual Johnnie Jamboree – a high school tournament giving squads a chance to tune things up prior to the season. "Not only are we excited about taking on the reigning champions, we're looking forward to playing in front of a large crowd," said Daehn. "This game should showcase some great lacrosse and we hope it will be one of the best atmospheres we play in all season." This year's Johnnie Jamboree field will include 12 varsity teams and four junior varsity teams from around the state. Last season, Saint John's fell to the Bison in Fargo, 14-6. This matchup will be North Dakota State's final game of the season and, with a 4-5 overall record, could be a must-win for a birth to nationals to defend its title. Saint John’s will also need victories this week for its bid hopes to the national tournament as the Johnnies are 3-2 overall but ranked No. 7 in the Under Armour MCLA Division II Weekly Coaches Poll. Following the upcoming games against No. 1 Minnesota-Duluth and No. 6 North Dakota State, Saint John's will wrap up the season with a road game in St. Paul against No. 4 St. Thomas on Saturday, April 13 as well as the home finale at Clemens Stadium against MCLA DI No. 24 Minnesota on Thursday, April 18.